View More In Slow Cookers - Page 5. Get better-than-restaurant-quality meals at home with the Sous Vide Power Precision Cooker. 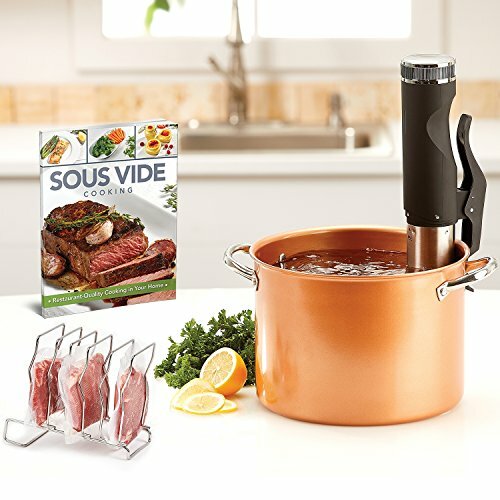 Using precise temperature control for consistent results, sous vide is a cooking technique that eliminates overcooking by heating and circulating the water in the pot for the perfect temperature at all times. Restaurants have been using sous vide cooking for years to cook food to the exact level of doneness desired, every time. With digital time and temperature display, the precision cooker is so easy to use: just clip the cooker to any pot filled with water, set the temperature controls on the cooker interface, drop in your ingredients in a sealed bag and press "Start." That's it! In no time at all, you'll have perfectly cooked steaks, shrimp, chicken, pork, lamb even desserts! The included recipe book offers great tips and recipe ideas to get you started. If you have any questions about this product by Sous, contact us by completing and submitting the form below. If you are looking for a specif part number, please include it with your message.